It’s not everyday that a guerrilla movement hosts an alternative art festival, but that’s exactly what just happened in southern Mexican city of San Cristobal, in the state of Chiapas. From July 23 to 30, over a thousand artists from 45 countries flocked to the city’s outskirts to participate in CompArte for Humanity, a festival of art, poetry and music organized by the left-wing militant group, the Zapatista Army of National Liberation (EZLN). It’s not everyday that a guerrilla movement hosts an alternative art festival, but that’s exactly what just happened in southern Mexican city of San Cristobal, in the state of Chiapas. From July 23 to 30, over a thousand artists from 45 countries flocked to the city’s outskirts to participate in CompArte for Humanity, a festival of art, poetry and music organized by the left-wing militant group, the Zapatista Army of National Liberation (EZLN). The EZLN declared war against the Mexican government in the 1990s, and today administers a handful of indigenous communities in the highlands of Chiapas. The movement’s ideology, Zapatismo, has garnered support across Mexico and abroad with its blend of Marxism and indigenous forms of horizontal community organization. In a statement explaining their motivations for holding an art festival, the EZLN indicated it views artists as playing crucial role in promoting social change. “We think that indeed, in the most difficult moments, when disillusionment and impotence are at a peak, the arts are the only thing capable of celebrating humanity,” read a joint statement from EZLN spokespeople Subcomandante Insurgente Moises and Subcomandante Insurgente Galeano. Describing art as “perhaps the last bastion of humanity in the worst situations,” they suggested the art festival was about more than promoting the EZLN. “The arts are the hope of humanity, not a militant cell,” Moises and Galeano stated. The result was a festival boasting an eclectic mix of everything from paintings and sketches to music, documentaries, theater, poetry and philosophy workshops. Much of the art had distinctly political and social themes, promoting social movements from every corner of the world. On the first day of the festival, Mexican wood carver David Arias Dijard told Upside Down World his art sought to promote real life heroes. Dijard’s exhibition featured a collection of handmade wooden “action figures.” However, instead of depicting superheroes like Batman or Superman, Dijard’s action figures were of revolutionaries like Mexico’s 20th Century rebel leader Emiliano Zapata, Argentine Marxist Ernesto “Che” Guevara, and EZLN icons Subcomandante Marcos and Comandanta Ramona. “The superheroes like Spiderman just destroy… but these heroes like Zapata … fought for the people,” he told Upside Down World. Another artist, Mexico City resident Ana Zoebisch, said her pieces were intended to promote the EZLN’s struggle. In particular, she said she has a passion for highlighting the role of women in the movement. 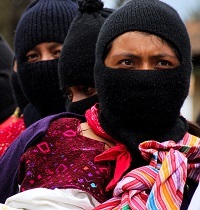 Gender equality is a key pillar of Zapatista ideology, and women reportedly comprise around a third of the EZLN’s armed forces. “The objective of my art is to introduce people to the Zapatista struggle, because there’s so much inaccurate information out there about them. People say they’re terrorists or killers, but this is a dignified fight,” she said. British poet Raga Woods said for her, CompArte was an opportunity to not only redefine art, but to also learn from other artists. “[Comparte] is like a big marketplace of people looking to find out about each other, and to find themselves. That’s rarely admitted: that we need to find out about ourselves,” she said. Her contribution to the festival was to host a workshop that quickly became an impassioned group discussion on misogynistic language. Even after some intense debate, the workshop ended with a group hug. Afterwards, Woods explained the workshop was almost entirely unplanned. “I work spontaneously and intuitively,” she said. Woods’ workshop was just one of many events at CompArte with a strong focus on engagement and dialogue between artists and audiences. The loose organization of the festival meant there was plenty of room for artists and visitors to debate and exchange ideas. The openness of the festival was even emphasized in the name, which is a play on the Spanish words for share (compartir) and art (arte). The Spanish word for share is also often used to describe a social gathering, or exchange of ideas. “Comparte is … an opportunity to see an experience another world, and the human creation,” she said. This open approach to dialogue between artists and other visitors set CompArte apart from convention art festivals, according to Argentine painter Martin Motta. “I don’t feel like this place is vertically organized, like most art galleries, universities, etc,” he said while taking a break from painting on the sixth day of the festival. “The artist isn’t treated like an inferior here. We’re all equal – horizontal and equal,” he said. This sentiment of artist autonomy was reflected in another communique from the EZLN’s spokespeople, Moises and Galeano. “No one should give orders to the arts,” they stated. “For us Zapatistas, you … are so important that we cannot imagine a future without your work,” they added. According to Moises and Galeano, the oldest artist to participate in CompArte was an 80 year old folk singer. The youngest artist was a six year old boy who danced to Son Jarocho, a form of folk music from the Mexican state of Veracruz. The vast array of art on offer wasn’t the only surprise for CompArte visitors. Shortly before the festival started, in early July the EZLN said they were suspending their involvement in organizing CompArte, so they could focus on providing solidarity to teachers protesting against the federal government’s controversial education reforms. Teachers and their supporters have blocked roads and established protest camps across Chiapas and neighboring Oaxaca states, prompting a violent police crackdown. As part of the EZLN’s support for the teachers, they donated around MX$290,000 (US$16,000) of food and medicine to the demonstrators on the barricades and in the protest camps. The food had originally been earmarked for feeding EZLN attendees at CompArte. In a statement, the EZLN said the funds for the basic goods were donated by Zapatista communities across Chiapas. “That is, it’s clean money, earned the way the immense majority of people of Mexico and the world earn: from work,” Moises and Galeano said. Despite initially pulling back from the festival, the EZLN surprised visitors by offering CompArte participants the chance to visit their de facto capital, the administrative center of Oventic. During the visit, guests were treated to indigenous folk music, and plays depicting the struggles of communities in the highlands. Between the songs and dances, Moises addressed visitors with a call for all of Mexico to organize and rebel against the government in their own ways. “It isn’t up to us to say how you must organize. Yes, we want to share all of our experiences, but we don’t know what the particularities of life are like for the workers, for the teachers, or for other people,” he told festival goers. “This [Capitalist] system doesn’t work, it is rotten, it cannot be fixed … we must organize ourselves to build a … new society,” he said. The EZLN again surprised visitors on the final day of CompArte, when hundreds of masked militants came down from the mountains to observe the last performances and exhibitions of the festival. The visit was an exceptional moment for the EZLN, which has rarely appeared in force in San Cristobal since their short lived capture of the city in 1994. 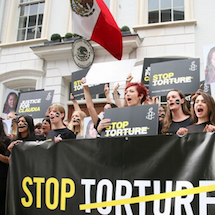 Over the past decade, the EZLN’s armed conflict with the Mexican state has been largely defensive, with the movement focusing more on promoting its ideals across Mexico and internationally of direct democracy and community autonomy. CompArte’s larger than expected turnout could be a sign this strategy is paying off. In total, 1,445 artists turned out, including over 300 from abroad. The EZLN’s next major public event is a festival commemorating the 20th anniversary of their Indigenous Congress, and will take place on October 12 in San Cristobal. Details of how to attend as an observer are available on the เล่นคาสิโนออนไลน์ให้ได้เงินEZLN’s website.